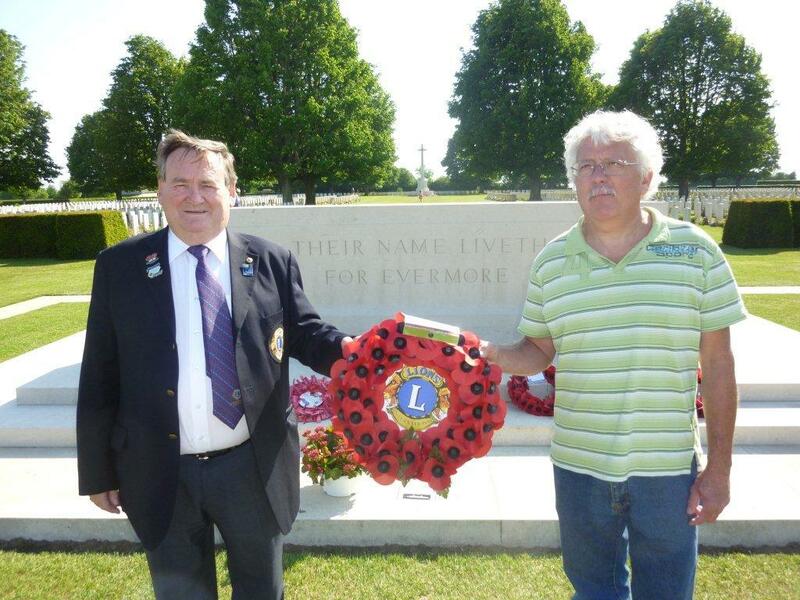 The Lions Clubs of Bridgend and Vimoutiers, a rural town in Normandy roughly the size of Cowbridge, have been twinned since 1979. Each year the Clubs meet - in even numbered years in France and in odd numbered years in Bridgend. The annual twinning meeting usually lasts a few days and allows club members to sample the lifestyle of the other club, staying with club members and there is normally a formal dinner to celebrate the twinning and invariably a presentation on behalf of both clubs is made to a local deserving cause. Demand for this essential addition to our emergency services was brought markedly home when the presentation was delayed an hour or so because the helicopter had to be called out to an emergency at a remote spot in West Wales, from where an injured person was flown to a local hospital. While awaiting the helicopter’s return, members of both clubs and their partners were given an interesting guided tour of Swansea Airport and its control tower. When the helicopter came finally over the horizon it landed just yards away, allowing members to closely inspect the craft. We must pay tribute to the crew who demonstrated and explained patiently the interior and fittings of the craft when they must have been exhausted after such difficult work on one of the hottest days of the year. The French guests were very impressed by the whole operation. 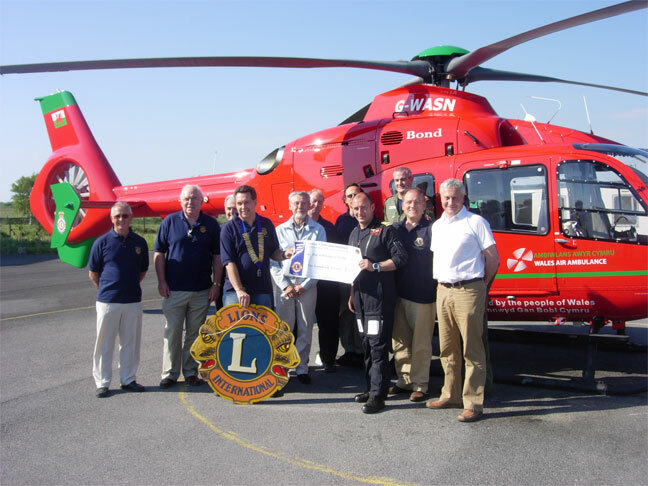 The photo below shows members of Bridgend and Vimoutiers Lions Clubs presenting the cheque to the crew of the Wales Air Ambulance. In 2010 our visit to France coincided with the anniversary of the WW2 Allied landings on the nearby Normandy beaches and added a poignancy to the usual bonhomie. To recognise the importance of the date, 6th June, the French hosts arranged an excursion for us to some of the most infamous wartime sites. The region was alive with British, American and French visitors of all ages. Many of those, of course, were war veterans, many people were dressed in period military uniforms, driving open-top jeeps and ancient motorcycles. After visiting the legendary Pegasus Bridge, a major objective at the start of the liberation, the party travelled to Arromanches on the coast and observed the beaches with the remains of the renowned artificial Mulberry Harbour. This was a particularly touching moment for one of the Bridgend Club’s members whose father was amongst those troops involved in the assault on these beaches. Now a small seaside town, Arromanches is alive with cafes and souvenir shops playing the 40’s tunes of the Glen Miller Band and Vera Lynn. The town and beaches on this gloriously sunny day were full of families with children sunbathing, paddling and enjoying themselves. It was quite a happy carnival atmosphere there, which was very much at odds with the horror of the events which had occurred 66 years earlier. Before returning to Vimoutiers, the Welsh and French clubs took the opportunity to stop at Bayeux War Cemetery to lay a Lions poppy wreath on the Memorial, and pause to remember. Members and partners enjoyed their traditional Twinning Dinner on Saturday night and a magnificent al fresco Sunday afternoon lunch before our departure for the ferry.